Billionaire Warren Buffett considers the late civil rights activist and icon Martin Luther King Jr. to be a source of great inspiration. In fact, Buffett and his late wife Susie saw King give a speech in Iowa just one day before beginning his 19th jail sentence for his involvement in the civil rights movement and six months before his assassination in 1968. 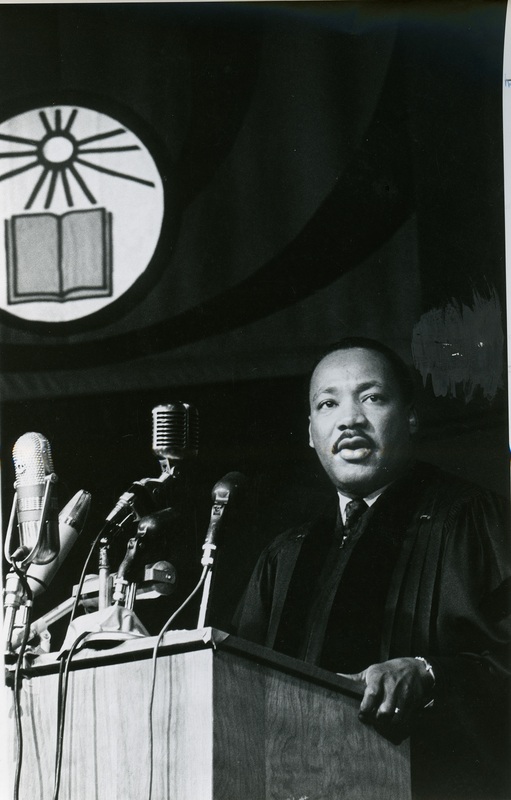 In October 1967, King visited Grinnell College to deliver a convocation address for a fundraising event linked with other well-known names of the time, including musician Louis Armstrong and author Ralph Ellison, as detailed in Alice Schroeder's book, "The Snowball: Warren Buffett and the Business of Life." Martin Luther King, Jr. taken at Grinnell College in 1967. Before a crowd of 5,000 people, the Nobel Peace prize-winner shared a speech titled, "Remaining Awake During a Revolution." "I remember that speech that Martin Luther King gave. That was one of the most inspiring speeches I've ever heard. Took me right out of my seat," Buffett said in the HBO documentary "Becoming Warren Buffett." "In that speech, he talked about 'truth forever on the scaffold, long forever on the throne, but that scaffold sways the future.' Well, he was going to be dead in six months, but that scaffold did sway the future," Buffett added. In that portion of the speech, King quoted 19th-century American poet James Russell Lowell's poem "The Present Crisis," which suggests that truth and righteousness always prevail. In their 30s, Buffett and Susie were supporters of Omaha's nonviolent activists in the midst of the civil rights movement during the 1950s and 1960s. Buffett attended local events around the city with Susie. As Time magazine reported in 2012, Buffett's interest in King and the civil rights movement "was the first time there had been space in Warren's life for anything outside of moneymaking and it was Susie's doing." "When the children were growing up, I was very involved in civil rights. I was immersed in it and I think that's what made Warren a democrat. He would go with me to hear speakers," Susie said in "Becoming Warren Buffett." Although Buffett grew up with a Republican congressman for a father and even served as the University of Pennsylvania's Young Republicans Club president, Susie helped shift his perspective. One of Buffett's best friends Carol Loomis, a renowned financial reporter, also said in "Becoming Warren Buffett" that "Susie led Warren toward changing his political views," adding that "she was the catalyst." "He believed the way she (Susan) believed in social justice and civil rights," Buffett's daughter Susie Buffett told USA Today. In the midst of what Schroeder said was the "greatest wave of riots, lootings and burnings since the Civil War," Susie worked with local organizations and friends to aid the fight for equality. For example, she pressured the YMCA and the boards of other organizations to equally distribute among their branches in poorer areas. She helped send black kids to summer camp through the United Methodist Community Center, which was run by an African-American friend of hers and set up an interracial dialogue group for high school students in the area. She also reportedly helped numerous black community members buy houses in white neighborhoods. "My wife was more active than I was, but I was 100 percent with her mentally, I was just working a little more on my own investments," Buffett said in "Becoming Warren Buffett." Buffett and Susie attended the Grinnell convocation by invitation of Joe Rosenfield, an alumnus of the private school who developed a special relationship with the Buffetts. While Rosenfield sought to grow the college's endowment fund, he became friends with the couple after sitting together and learning more about each other's shared political views and interests. There, another part of King's speech resonated with Buffett, according to Schroeder. "It may be true that the law cannot change the heart, but it can restrain the heartless," King said. "With that great voice of his, he just rumbled that out, and then went on and used that as a theme," Buffett commented in "The Snowball." After King's speech at Grinnell, Buffett felt "a sense of urgency to do something more for civil rights too," Schroeder wrote. "My politics became more overt after my dad died," Buffett said in "Becoming Warren Buffet." "You know, in 1776, Thomas Jefferson wrote 'All men are created equal' and then when they wrote the Constitution, they all of a sudden decided: No, it was just three-fifths of a person if you were black. I mean that struck me as kind of crazy." Buffett worked with his friend Rosenfield to grow the college's endowment to help students with financial need and continue to serve on the Grinnell College Board of Trustees for years afterward, a spokesperson for Grinnell College tells CNBC Make It. The speech also inspired him to fight the anti-Semitism of older members of his family and his community. Jews couldn't join local country clubs for years, the Omaha World-Herald reported, until Buffett joined the all-Jewish Highland Country Club. This pressured Omaha Club to accept his Jewish friend as a member. Buffett and Susie were among the first non-Jews to join an all-Jewish country club in Omaha and thus encouraged other clubs there to permit Jewish members, The New York Times later reported. "Civil rights changed my views," Buffett said in "Becoming Warren Buffett." King would have been 89 years old today, just a year and a half older than Buffett.